The I/F 9 is designed to enable the user to perform DC parametric, Capacitance/RG, Inductive Load and Thermal testing at one test site. Furthermore, it has the ability to perform these tests on a single or dual device. Those users with single test site device handlers will find the I/F 9 to be essential for comprehensive single pass testing of their devices. 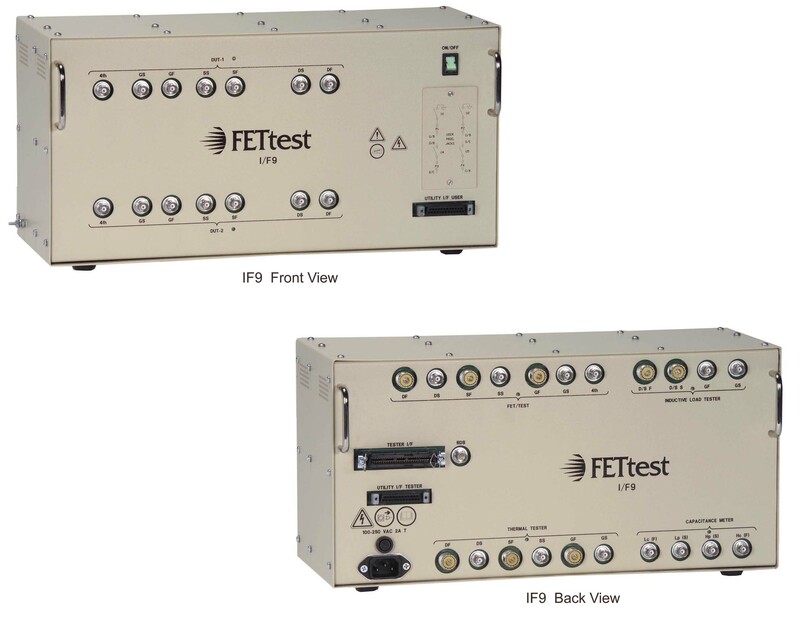 The external instruments used in conjunction with the I/F 9, an Inductive Load tester, Thermal tester and LCR meter, are controlled by the FETtest operating system via the IEEE-488 bus. The user is able to program these instruments within their FETtest device program. Upon completion of testing, the FETtest will issue a single BIN result to the handler. The I/F 9 can be used with one, two or three external instruments. All switching relays in the IF9 are contained in a box that can be mounted on or near the handler.